We know that you’re not ready for it. You just got over back to school and you’re probably thinking about fall foliage and apple picking. Well, think ahead further. 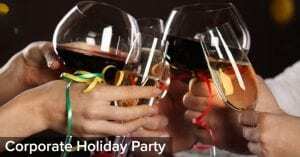 The holiday season is going to be here before you know it and if you’re in charge of setting up your company’s holiday party, it’s a good idea to start planning now. There’s a lot that goes into planning corporate parties, but if you book your event with Skyline Cruises, you’ll have already found the perfect venue. Our 3-deck luxury yacht the Skyline Princess has been the site of many spectacular corporate events since we started business in 1993. We want to let you know why you should book early for your 2017-2018 corporate holiday cruise. If you’re planning the company party, you should know that opportunities slip away fast. Party planning expert Sarkis Vartanian recently told the Los Angeles Downtown News, “Days and times get booked up very early, so people should book an event three to four months in advance.” The closer you get to the holiday season, the more difficult it is to get the venue you want. You also want to make certain you book your holiday party at the right time. Skyline strongly recommends that any NYC corporate cruise is booked on weekdays. Employees and guests usually have family obligations on weekends and it’s considered better etiquette not to interfere with their outside the office life. Once you book the Skyline Princess, you’ll see why it’s the perfect location for this and all types of celebrations. It’s Coast Guard certified to carry 450 passengers and it sails all year round. The Skyline Princess is climate controlled and the top deck called the “Skylight Deck,” which contains a dance floor and a DJ space, can be open air or fully enclosed. The first deck of the ship is an ideal dining space. All of our food is prepared by our in-house chef and we can accommodate anything from a casual cocktail party to a full sit-down banquet. In fact, we’re used to planning all types of events, from holiday parties to corporate meetings to celebrations like birthdays, Bar/Bat Mitzvahs and weddings. We work with both large and small companies and groups. You can do a full ship charter of the Skyline Princess, but we also rent out private decks on our public cruises. For smaller groups, we’ll reserve a table or two on a public cruise. In fact, some of Skyline’s most popular events are smaller weddings which involve just a small number of people. We’re used to dealing with all sorts of groups and events with all kinds of budgets. A Skyline Cruise costs much less than you think. Our public cruises leave from our home port at the World’s Fair Marina. You’ll see the iconic sights of New York, including The Empire State Building, Brooklyn Bridge, Ellis Island and the Statue of Liberty. We also can provide full ship private charters from many ports in NY, NJ, LI, Westchester and Connecticut. If you book your holiday party with Skyline Cruises, your employees and guests will remember it forever. But don’t wait, you want to make sure you reserve your company’s spot. Contact Skyline today.